I promise that this post is timely. Alex Wood has been a pleasant surprise. When he first came over from Atlanta two years ago I figured he would be a good candidate for the back-end of the rotation. As we have all come to understand though, he is proving himself to be one of the best in the league. If not for having Kershaw in the rotation he likely would be labelled our staff ace. 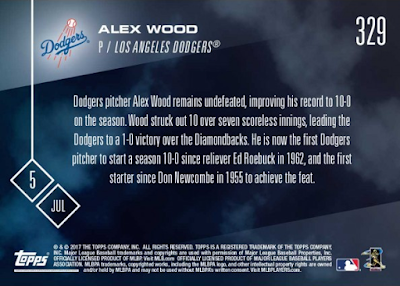 Last night Alex Wood recorded his tenth victory of the season, and Topps honored this achievement with a 2017 Topps Now card. See it out above and below. Go here to check it out and order. Below is what is says on the reverse of his Topps Now card. 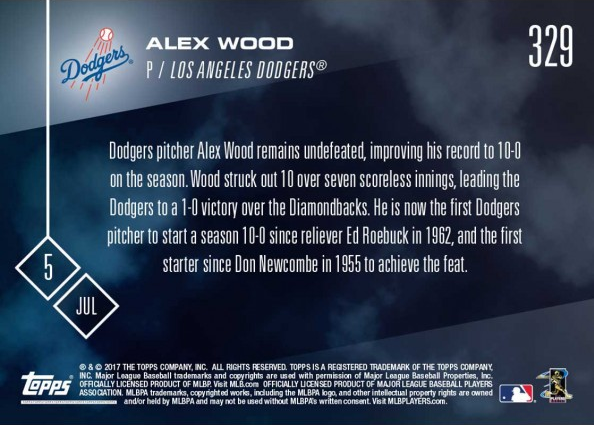 Dodgers pitcher Alex Wood remains undefeated, improving his record to 10-0 on the season. Wood struck out 10 over seven scoreless innings, leading the Dodgers to a 1-0 victory over the Diamondbacks. He is now the first Dodgers pitcher to start a season 10-0 since reliever Ed Roebuck in 1962, and the first starter since Don Newcombe in 1955 to achieve the feat. 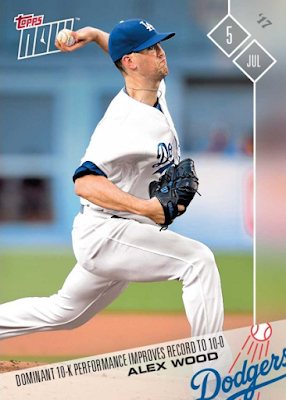 UPDATE: the total print run for the above Alex Wood card is 358 copies.